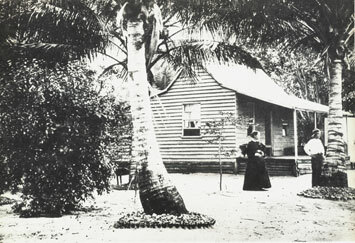 English born John Greenwood Barnes arrived in Mackay in 1863 and was the earliest settler on the northern side of the Pioneer River. Barnes had spent ten years in Victoria, perhaps initially at the goldfields, but he had developed an interest in gardening. From 1865, he was trialling edible plant species for Baron von Mueller, the German curator of the Melbourne Botanic Gardens. A wide variety of tropical and sub-tropical species included breadfruit, date palms, mango, tamarind, guava, citrus, peach and apple, pineapples, pawpaws, bananas, melon, spices and green vegetables. The Mackay Mercury reported in 1868, "Two young vigorous looking orange trees were blooming in foliage, their branches literally loaded with golden fruit, fast-ripening under the genial influence of climate and the good quality of the ground". But it was the coconut palms initially planted in 1867 which increased to a plantation of 1200 trees that brought real fame. "These trees, growing in a most luxuriant manner, produce very fine fruit which were of much larger size than those obtained from the South Seas." Cremorne was already a popular venue for weekend entertainment when in 1884, Barnes erected a two-storey hotel which featured a promenade roof. Attractions for children were provided and fundraising fetes and concerts held in Cremorne Gardens, which were possibly based on Cremorne Gardens in Melbourne, rather than those in London. developing his gardens by his father-in-law and former business partner, William Seaward, remembered for his keen interest in horticultural and agricultural pursuits.